Yesterday my daughter Elise and I enjoyed a mother/daughter day down in Gloucester and Rockport, MA. We stopped here, at Niles beach in Gloucester, to walk around and so Elise could be a little silly. More of that to come. I love this photo! Thanks for sharing. I so miss the ocean, time for a trip to the Atlantic! Macros are the most fun pics to take! Two words --- LOVE IT! That's my stomping grounds where I learned to swim! And as I got older...."Spin the Bottle"! Yo u photo brought a warm smile - thanks for the different look at what is so close and so often unnoticed. I love this image Sharon. I saw the photo shortly after you posted this morning and I thought about it throughout the day. It really makes me smile! What IS IT about those gull footsteps that make me smile from ear to ear? Love your footprints in the sand.I think there is a poem about that but they are not sea gulls that leave them. That looks like a very wonderful place to play and get silly. Love the glistening sand. Now if it was only 90 degrees to go with it! The sand is shimmering like snow. Beautiful macro. I love this photo too Sharon! 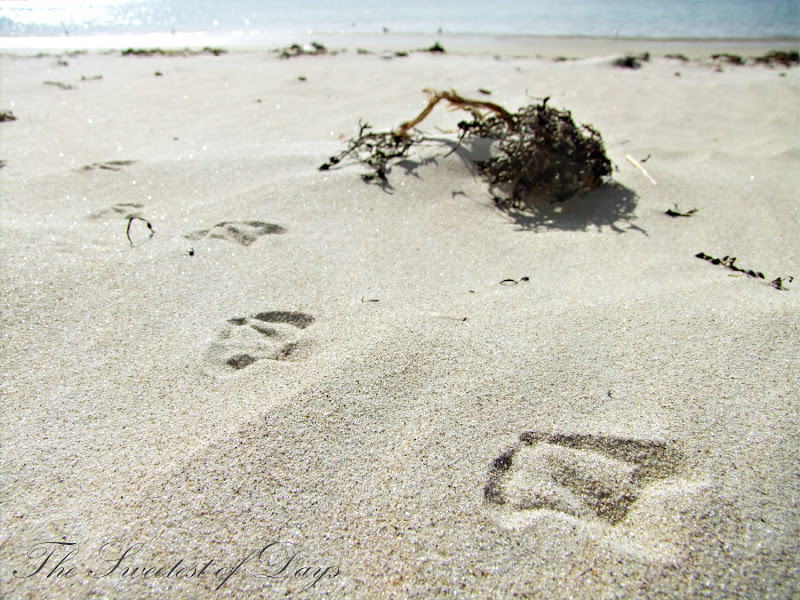 Love those little gull feetie footprints :) There are very few things that beat a stroll on the beach. ***sigh*** love this, Sharon -- the little bit of sun glinting off the water is perfection! I'm sorry if anyone received that spam. I've deleted it. It's like being there! Ok now I want Summer to come and I want a macro! Love the photo here. I can see all the little grains of sand and the strip of water. Beautiful, Sharon. Adorable and would look good in a frame on the wall! Loved the perspective you took that shot from!! !